A friend of mine were so excited of his new tablet and approached me to do a favor of installing one of the favorite games you can find in Google Play Store. He left his tablet on my desk for me to install Plants Vs Zombies 2, Candy Crush Saga. During my free time I decided to explore his tablet to check the specs and other hardware details before installing the apps he want. The device runs on Jellybean 4.2.2 OS and has a dual core processor with 7-inch TFT 480x800 screen resolution. After checking, the user has not yet created a Google Account to use Play Store. I created a generic account pattern by my friend details the signed in and use the Apps Store. 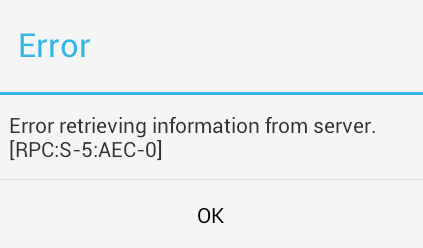 I first search a game then click on one of the results displayed, tap on the install button to download and install the app but this is where the error "Error retrieving information from server.[RPC:S-5:AEC-0]". I thought this is just a simple error that can be fixed by rebooting the device but after I restart the tablet and open the Play Store the error still appears. I tried Googling and found lot of solutions to fix this kind of error but I found the only solutions that works on my issue. 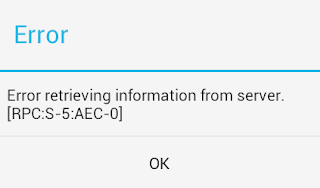 Upon reading many solutions, I found out that this error does not occur on tablet only as some Android mobile phone users also get the same error. Go to 'Settings' then scroll down and tap 'Apps', on other device its 'Application Manager', 'Applications' or 'Manage Applications'. Swipe your tablet or phone screen going left until you reach the top label 'All'. Once all apps are displayed, scroll down and look for 'Google Play Store' the tap. Next is tap on back key of your device to go back to 'All' apps look for 'Google Services Framework' then tap again. Click on 'Clear Cache' and 'Clear data' under App info and then click 'Force Stop'. If your tablet has 'Google Play Services' installed in 'All' apps, repeat Step No. 4 also. Lastly, REBOOT your phone or tablet right after doing the steps above. Note: Do not open Play Store right without restarting you device right after all the steps is done, it will just prompt you an error some like 'Unfortunately, the app has stopped' message. Another step may help you solve when you're having this kind of error during update on Applications and games that are already installed is by clearing the cache and data of 'Download Manager' that can be found also on 'All' apps. That's it, open Play Store then accept the terms again since we cleared the data on above steps.